Stand 9 - These modern houses are on the site of the Invicta Leather Works, Paynes Hill. 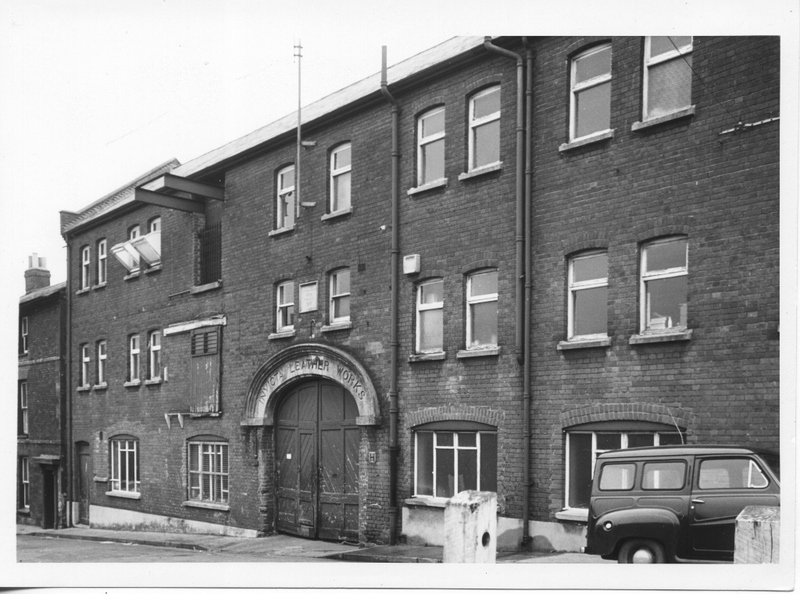 This photograph shows the Invicta Leather Works in 1966. Originally established down in central Salisbury in 1824, the works moved to this site in 1901, after a disastrous fire. During the 1920s it was taken over by a German firm and renamed ‘The Colonia Works’. German ownership ended abruptly in 1939, when the works were taken over by the British Government and afterwards by a British company, under the new name ‘Invicta’. As such, it continued in production until 1970. Already famous as the largest leather works in the west of England, Invicta went from strength to strength after 1901. It carried out every stage in the process, from tanning the hides to making the end products ‘everything from a belt to a saddle’. One of its celebrated specialities was ‘exotics’ – shoes, handbags, etc., from the skins of reptiles and rare species. In its latter years it was even commissioned to produce a set of matching accessories, in mauve crocodile skin, for Her Majesty Queen Elizabeth the Queen Mother. The firm employed over 300 local people, men and women and was by all accounts a good employer. One interviewee has told us she earned £7 a week here, in the 1950s. The downside was that some departments were downright unpleasant to work in – hot and stinking – and many people did not stay long. ‘Smelly, very…I was a dresser, I used to have to match all the shades up on the skins and they done snake skins and crocs…sheep and goats’ skins. But you had to work hard mind to get any money…you had to wear gloves and they had big scissors…and if you didn’t wear any gloves you had blisters on your hands. And you had to do a dozen, for tuppence ha’penny’. Invicta was not always a good neighbour. 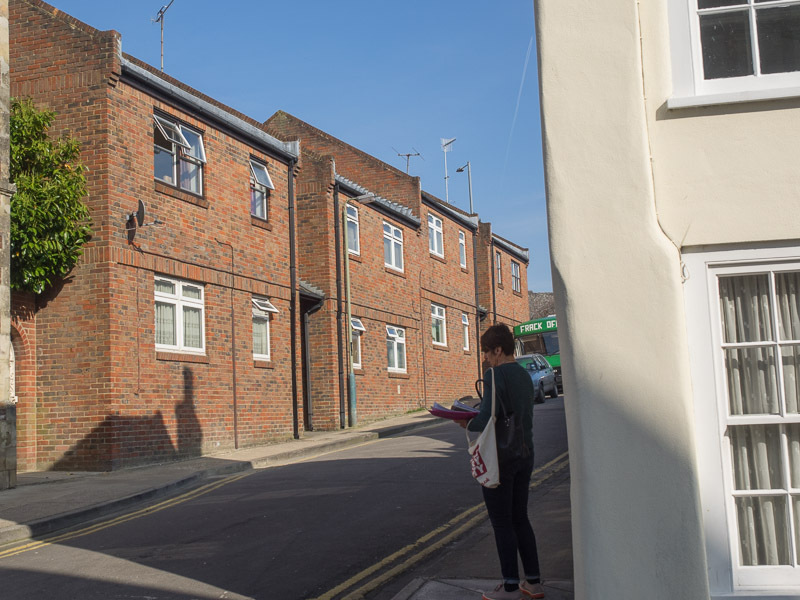 In a westerly wind, the women of Rampart Road experienced life downwind of a large, smelly neighbour. Washing came in from the line from the back green covered in brown spots. Worse still – the spots then developed into holes. 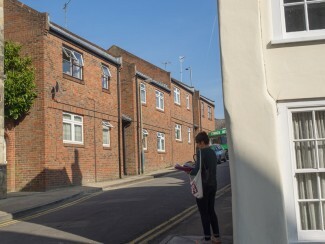 We were told that complaints to Invicta and the Council were met, initially, with the answer that the factory had been there before the houses (a historical misconception). However, eventually a satisfactory solution was reached, when Invicta agreed to increase the height of their chimney. 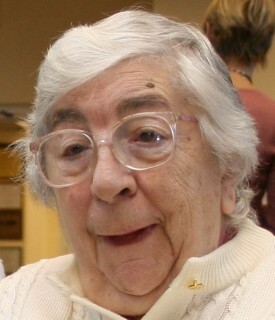 June Handford made a complaint to the Invicta Leather Works. Listen to what happened on the audio clip at the right of the page or on your downloaded MP3 file from the Downloads page. Now return back down Paynes Hill and turn left into Dolphin Street to St Ann Street. Stop at the large timbered building just to your right, on the opposite side of the street, labelled ‘Joiners’ Hall’.